There is this societal misconception that, symbolically, “white” equals purity and tranquility and “black” equals evil and turmoil. But that simply is not true, and MAD TV’s Spy vs. Spy debunks that theory completely, as both color spies are equally sneaky! Seeing as Halloween is the ideal time to have it all and let loose, why not embody the best of both sides and dress in this Deluxe Black and White Spy Costume? Other fans of the MAD TV show (and the original comics) will be so jealous that they didn’t find this costume first. But maybe you can get them in on your plan to play tricks and create chaos at the party. 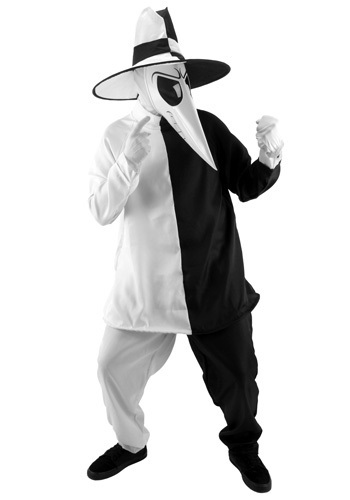 Dressed as both the white and black spy, you can spend the whole night just trying to outdo yourself, which is bound to keep you both busy and active (though, you may look a little silly to those not in the know). No matter to you--you’re having the spy time of your life, living it up and letting the other guy have it...even if the “other guy” is also you. This suit is genius; it is divided in half--one side black and the other white--a theme that goes all the way to the tip of the hat and all the way down to the pant cuffs. The face mask provides the ultimate Spy vs. Spy detail that will tip you off to all your fellow partygoers, but you’ll be so busy hiding (toy) dynamite around the room, you won’t even notice.